If you have no truck tire carrier installed in your truck you might have dealt with the stress and expense when your tire failed or punctured all of a sudden in the middle of a road. Those moments are really dreaded and full of pain! Why to carry so much stress while driving your truck? Install a proper truck tire carrier and carry your spare tire securely and safely behind the cab. Stop being at the mercy of others and tire guys on the highways. There are several brands of truck tire carriers that manufacture innovative tire carriers for truck and custom installation for easy driving. They are designed, manufactured and installed in your vehicle keeping in mind individual needs. TireGate is a popular brand of truck tire carriers and it has several types of tire carriers for small, mid size and regular trucks. The tire carriers of TireGate are designed to maintain proper ground clearance and bed space. The carried are made of high quality materials to resist corrosion, wear and tear. Given below are few types of TireGate tire carriers. PreRunner Tire Carriers: This tire carrier from TireGate enables you to haul tires of all sizes for mid, small and medium trucks. The carrier is mounted directly into the factory tailgate mount position of your truck and there is no drilling, cutting, welding required for this tire carrier installation. The carrier is easy to uninstall. Installing this tire carrier won’t affect the opening of tiregate. It will open wide and allow complete and easy access to the truck bed. VT TireGate Carriers: The TireGate line is very much perfect for crawling, working, camping and everyday use. The VT truck tire carriers can be easily mounted vertically behind your truck or over the rear bumpers. The carrier doesn’t come in the middle of your tailgate opening. It opens wide and allows you easy access to your truck bed and never kills cargo space in your truck. VT is tough truck tire carrier and allows you to haul 40” tires as well as 35” tires maintaining proper bed space and ground clearance. This tie carrier too requires no cutting, welding, or drilling and is mounted into the factory tailgate. UTV Truck Tire Carriers: This is a high quality truck tire carrier which solves your problem of tire carrying in your truck. TireGate has whole line of UTC tire carriers and each model differs in quality and other ways. You have different types of carriers from this series- bed mounted carriers, premium swing carriers, tailgate carriers, roll cage carriers and others. Appearance, quality and integrity are high priority of these carriers. Truck Nerf Bars and Steps: Make Your Truck Look Great! There is literally no end to truck nerf bars and steps in the market. Whether you call them side steps, step bars, tube steps, it all means the same – truck nerf bars and steps! They are the most popular accessories of your truck and are primarily made of chrome, black powder coat and stainless steel. They also come in variety of styles and most of them require no drilling for installation. They are simply mounted on the holes that exist in the truck body or frames. The main purpose is obvious you make your truck look great and yes help yourself get in and out of the truck conveniently. The truck Nerf bars and steps are also purposeful to protect the doors of your truck from bottom and front fenders from debris, tall rocks and other intruding materials that come on its way while plying on rough terrains. The look that such Nerf bars provide is simply awesome! 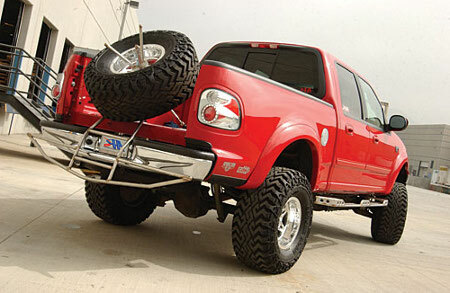 There are basically two types of Nerf bars available for trucks – short Nerf bars and long nerf bars. Short Nerf Bars: These bars or truck side steps end just behind the door of the cabin. The bars begin behind the front wheel and extend just to that position that it helps you to get in and out of the cab. They are mostly made of chromed steel and rubber insets for footpads. Long Nerf Bars: These bars are popular among those who need who love to extend the bars to the position to front tip of end wheels. This enables not only to come in and out of the cabin, but also to get into bed of the truck easily. The long nerf bars thus provide style, assistance in getting into cab and into the bed of the truck! Westin Nerf Bars: They are considered number one bar in the market and is a familiar name. The brand stands for quality and has a series of nerf bars and steps for your truck. Go Rhino Side Steps: This is another popular brand of truck nerf bars which is installed by millions in their trucks. They add something to your truck and would be noticed for their style and design. Such side steps demand respect and have full line of great products that come with unique designs. There are many other Dee Zee Steps Bars, Aries Nerf Bars, Putco Nerf Bars, and others which can enhance the look of your of your truck. Truck Power Side Steps: Which One Should I Choose? Truck power side steps literally makes in an out of your vehicle convenient after a hard days work. They are accessories that make your truck purposeful and useful all the way. If you have been trying too hard to get perfect types of truck power side steps then you can have a look at the following types of brands that are used by large number of truck drivers across the nation. Besides these brands and types of truck side steps you can have a look at other popular brands that are easily available online. Kodiak SideWinder Side Step: This is a wonderful side step which comes to your rescue when you find it difficult to get in and out of the truck. With this side step you have easy access and entry to your truck. As you open the door the SideWinder will automatically greet you for an easy step up and step down. These brands of side steps are good for your truck because as you close the door the side steps discretely tuck the truck step away. Such tucking of the side steps provides no odd look to your truck or creates no problem when you drive through narrow lanes. The side steps are also perfect when it comes to safety and is equipped with special clutch. The clutch will stop the movement of the steps in either direction even if there are resistances or obstacles. At the same time you have the freedom to active Truck power side steps with the help of door pins that you have for indoor light. They get activated only when the door is opened. Installation of such truck power side will take just an hour or so. You can maintain well ground clearance even on vehicles that are un-lifted! Rhino Universal-Fit: These truck power side steps are spring step side with hinge system functions. As you apply pressure the swinging steps they step down 3 inches to accommodate an easy entry and exit from your truck. These power side steps too hinge activate when you need it and retracts back when you don’t need them. 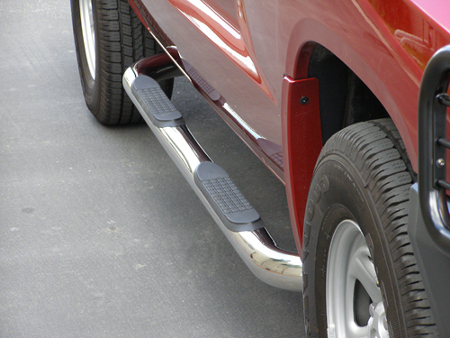 The side steps have been cleverly designed for to give SUVs and trucks style and functionality. They are convenient side steps for your truck that you can install. The side steps provide good ground clearance and they are available in different colors, and coats. The chrome and polished stainless finish of Rhino match the excellent aesthetic quality of your vehicle. Floor mats are one of the essential accessories that you ought to purchase for your truck. Floor mats for truck protect the factory carpet of your vehicle from the abuses of dirt, grime or anything that dirty hooves usually track in your truck. Since your truck is a hard working vehicle you need tough floor mats for it. To keep the interior of your truck clean and safe, invest in high quality floor mats. If you love your truck you should take care of its interiors too along with other maintenance. 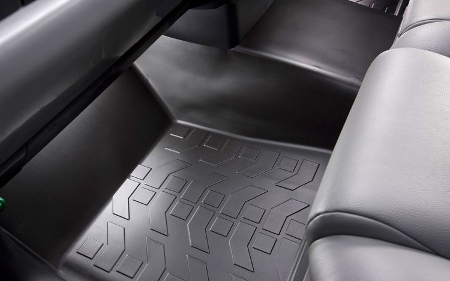 Include high quality floor mats to your truck and see how they protect your truck’s floor stains, dirt and corrosion. They act as protective shield between your truck floor and everything that is put in its interiors like tools, dirty shoes, food items, equipments and other such abuses. So while you choose floor mats for your truck make sure that you choose something which is easy to clean and something that is stain resistant. There are different types of truck floor mats that are available in the market. They are made of different types of materials to resist abuses and protect the floor of your truck. Lloyd TruBerber Carpet Floor Mats: These are custom fir Berber mats which has 48 ounces of yarn weight for longer life. The material used to make these mats is mix of polypropylene with crush resistance nylon. The yarn colors of the mat hide surface soiling and they are specifically formulated for intrinsic confrontation to fading and stains. They are stylish and come with a warranty of 5 years. Husky Floor Liners: The Husky truck floor mats are custom fit for your trucks. They provide rugged protection to your vehicle and prevent soiling and stain. They are tough and made of patent rubberized material that are resistant to chemical attacks including battery acids, oils and other chemicals. Each product is custom fit and the floor mats are designed to fit all types of trucks. The floor mats have backside nibs which ensure that they stay in proper position. You just need to wipe the floor mats to clean them. Like the above mentioned brands of floor mats for truck, there are many other brands too which manufacture all weather truck floor mats which are resistant to all types of abuses and external elements. Buy floor mats which come with good warranty and can provide extra protection to the floors of your truck. For most truck lovers, there isn’t anything better than a great looking truck. If you own a pick up truck and want it to look unique, here are a few tips that can really set it apart from the rest of the trucks in your area. Just like car owners like to customize their vehicle for ultimate style, your truck can also easily look better with nice new tires and shiny customized rims. Wheels are usually some of the easiest components to upgrade. Many truck owners usually upgrade their tires to ones that are not only thicker, but also larger. For instance, going from 18 inch to 20 inch wheels or larger is quite common. It should be noted that if you are going with thicker wheels make sure that your tire wells are able to cover the width of the wheel, if not your vehicle can be illegal on the street or require wheel well extensions so that your tires do not kick up rocks and other debris on the road. Let’s face it, lighting can add style and functionality to your vehicle. It is quite easy to add some fog lights to your vehicle or even off road lighting. Whether you hit the trails or not, lighting is one way to enhance your pick up truck. And the cost of most lighting is relatively affordable costing only a few hundred bucks. Brush guards are another way to add style and make you and your vehicle ready for the harshest off road trails. These guards come in a wide variety of sizes and styles to fit your truck perfectly. They not only protect your vehicle from tree branches and bushes, but are perfect for pushing objects out of your way.